COOKIES & COCOA is a festive cookie decorating workshop for adults. 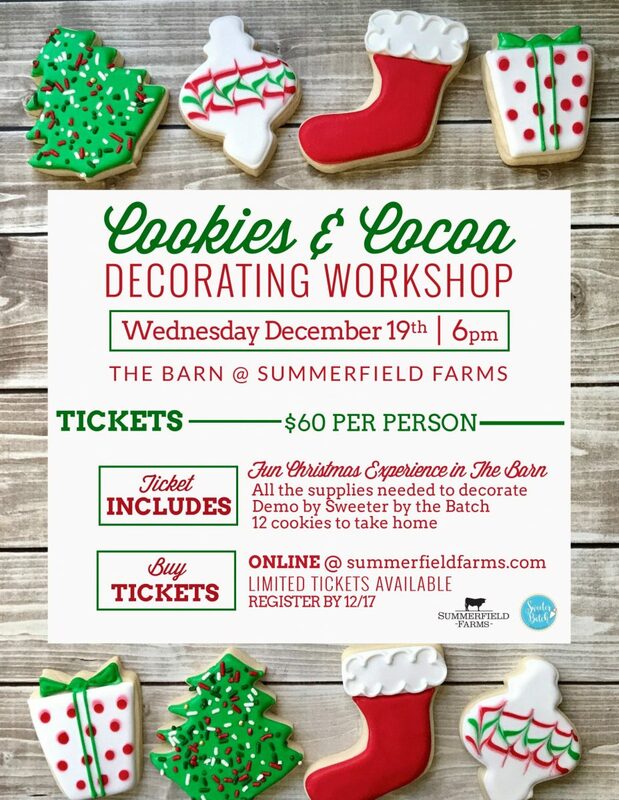 Celebrate the season with a themed cookie decorating workshop with Sweeter By The Batch in The Barn at Summerfield Farms. Your ticket includes a demo by the amazing ladies from Sweeter by The Batch and 12 Christmas cookies to decorate & devour! Plus, it includes a hot cocoa to enjoy while you decorate!! Wine & snacks will be available for purchase (cash or card). *This event is for ages 21+ only. Limited spots. Ticket sales end Monday, Dec 17 @ 10pm. receive 10% off your next purchase at The Market!